If you want to see the future, you can start with the VA, America’s largest integrated health system. Penn Nursing faculty and alums are helping forge the path. What do gps, chariots, and duct tape have in common? They were military innovations that found their way into civilian life–along with the internal combustion engine and the Internet. We all owe a debt to armed forces’ visionaries whose technologies and systems we use every day. Same with the Veterans Administration: from bar coding medicines to developing a new pain scale to discovering that a daily aspirin cuts in half the rate of heart attacks in patients with unstable angina, the VA is an incubator for innovations that improve the quality of life not only for veterans, but also for civilian populations around the world. And Penn Nursing is at the leading edge of research in the most exciting VA innovations. “The VA, as a closed, contained health care system provides some of the best opportunity to see the full impact of what it provides to a specific population,” said Julie Sochalski PHD FAAN RN, Associate Dean for Academic Programs at Penn Nursing. Illustration by Sarah MaycockIn 2011, Mary Ersek PHD RN FPCN, Penn Nursing’s Killebrew-Censits Chair in Undergraduate Education and Professor of Palliative Care, accepted a dual position as Director of the Veteran Experience Center, a national quality improvement initiative housed at Philadelphia’s Corporal Michael J. Crescenz VA Medical Center (CMCVAMC). 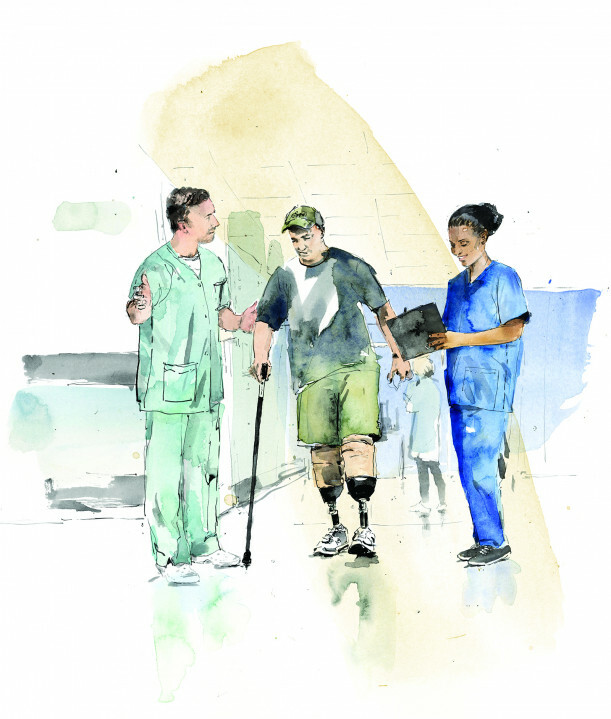 The Center’s mission is to improve the quality of end-of-life care across the VA’s integrated health care system. The work is satisfying, she said, because it enables her to apply the sophisticated analytic skills she acquired through her research so that clinicians can use data to improve care. “That immediate translation of research into clinical practice was, and remains, very enticing and rewarding,” she said. “Certainly veterans do seek health care outside the VA, but a large number of them do seek it there,” said Dr. Sochalski. Large enough, according to the Veterans Health Administration, to make the VA the U.S.’s largest integrated health system and the top employer of nurse practitioners–sort of a microcosm of the state of the nation’s health care. Along the way, it has created data systems for tracking outcomes–and that data is turning into a gold mine. If you’re following breakthroughs in health care, here are four that should put the Veterans Health Administration-Penn Nursing partnership at the top of your watch list. “Change, no matter how you look at it, is hard,” said Amy Sawyer PHD RN, Penn Nursing’s Associate Professor of Sleep & Health Behavior who is currently leading 15 evidence-based quality improvement projects at the Philadelphia VA addressing varied practices at the medical center. Examples include pressure injury prevention in surgical patients, pre-operative warming for prevention of intraoperative hypothermia, and secondary traumatic stress in health care providers. “It’s hard,” she said, “to accept and it’s hard to convey to others that change needs to happen.” One recent occupational health project involved switching from PPD to the T-SPOT.TB for testing incoming employees for tuberculosis. Unlike the standard PPD, the T-SPOT.TB does not require a follow up visit after 48 to 72 hours. During a PPD shortage a couple of year ago, VA clinicians put the T-SPOT.TB procedure in place and followed it for a year. “It was cost effective,” said Sawyer. “You aren’t bringing people back for a second appointment.” She notes that, while the T-SPOT.TB test requires a potentially off-putting blood draw, the test puts less burden on patients and employees, requires less time and money, “and if there’s a positive result, treatment can begin immediately.” The program, which has since rolled out across the entire VA system, saw a 29 percent increase in employee compliance, a 40 percent drop in costs, and a 50 percent reduction in time to clear new hires. Some of the nation’s top medical centers— including Duke, Stanford, Mount Sinai of New York, and Kaiser—use versions of the BFS. Soon, the Centers for Medicare and Medicaid Services will require every Medicare-certified hospice in the country to report findings from a similar survey. Demographics are shifting for the veteran population. “In recent years they were mostly World War II and Korean War vets,” said Dr. Kutney-Lee. 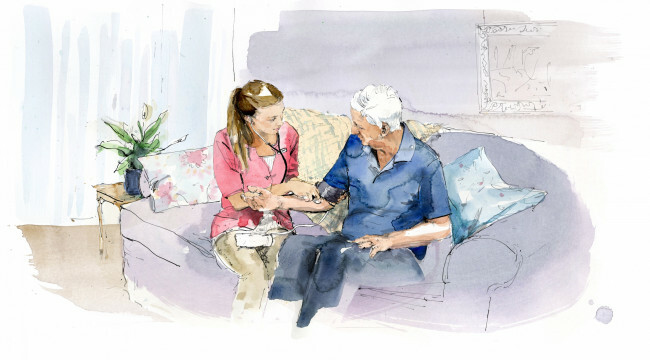 “They are now at the end of their life span and we’re seeing a new wave who served in Vietnam.” The change in demographics has implications for end-of-life care. Veterans from the Vietnam era, she said, are more likely to have been exposed to dangerous combat situations that they were unable to escape. “Many veterans were fighting in jungles and mountains, there were hidden explosives planted, all with a near constant threat of being ambushed…the nature of the direct combat situations was very different.” And the way in which society welcomed home the veterans was different. World War II vets were treated as heroes. They enjoyed national support. They were seen as having fought for a cause. But Vietnam was different. “They were not welcomed when they got home,” said Dr. Kutney-Lee. “Things were thrown at them when they got off the planes and they are less willing to talk about their experiences.” This, she said, can bubble up emotionally at the end of life. Unlike World War II vets, those who served in Vietnam may never have had a chance to process their experiences. 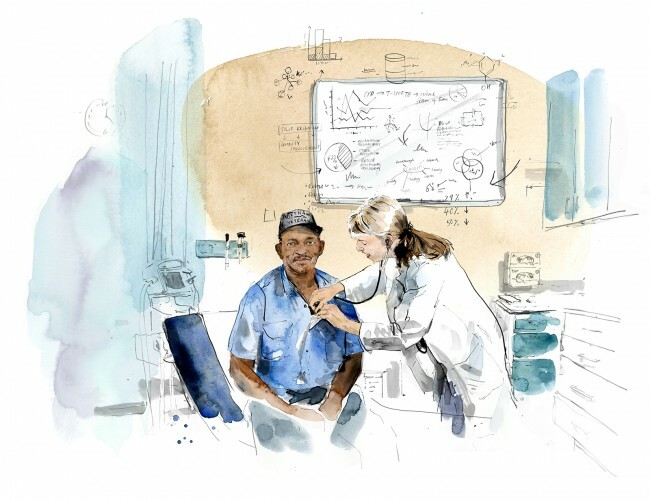 VA research looks at the relationship of pain and behavioral health–and a lot of the researchers’ conversations dwell in how to integrate behavioral health into primary care. One promising area: acupuncture. It may come as a surprise to some, but the VA and the Department of Defense are among the largest users of acupuncture in the nation. “Battlefield acupuncture,” developed by Air Force physician Richard Niemtzow MD, entails inserting small needles in a patient’s earlobes. Unlike standard acupuncture, the practitioner need not be licensed. “It can be taught easily,” said Assistant Dean Coy Smith. Polomano also teaches Pain Science and Practice, a class open to students from Penn Nursing as well as Penn’s dental and medical schools. According to the syllabus, the “interprofessional course focuses on the biopsychosocial aspects of pain and pain management from the perspectives of individualized pain care, scientific discoveries, evidence-based practice and cross-disciplinary learning.” This year, in partnership with the Uniformed Services University Graduate School of Nursing in Bethesda, MD, 30 active duty military personnel from their nurse anesthesia program attended the class. Penn Nursing alumna, Dr. Caroline Angel, now of the Reintegrative Health Initiative, reports that the evidence indicates that the stigma around seeking treatment for mental health is one of the biggest challenges faced by veterans who are struggling with PTSD in their reintegration. “Lack of accessible services can also present a barrier,” she said. These challenges also apply beyond those facing PTSD to include a broad range of mental health and reintegration issues. Clearly, there’s more work to be done. Nurses work at the heart of the changes in veterans’ care—and, therefore, in helping to determine the future of American health care. “Much of the VA’s innovative models of care delivery are due to the leadership and contributions of VA nurses,” said Distinguished Health Policy Fellow at the Penn’s Leonard Davis Institute of Health Economics, David Shulkin MD, a former Secretary of Veterans Affairs. “It’s often their affiliation with leading academic centers like Penn that help to ensure the VA remains at the forefront of these innovations.” Shulkin, a Penn professor before he headed the VA, said his tenure with the government was highly influenced by his university experience. “Penn Nursing’s leadership in primary care-based nursing and community-based nursing was influential in my thinking on expanding new models of care for veterans,” he said. For example, Shulkin’s VHA Directive 1350, issued in 2017, used the power of “federal supremacy” to grant full practice authority to more than 5,000 advance practice nurses working in all 50 states. Their ability to practice to the full extent of their training and licensure without physician supervision at VA facilities, even in states with laws that would otherwise prohibit them from doing so, was a big step in promoting high-level nursing care. This one step, enabling full scope of practice, arguably constitutes the single most important recent advance at the VA.
Louis Greenstein is a writer living in Philadelphia.